Bioderm is a topical preparation that helps prevent infection and aids healing of minor cuts, scrapes and burns. Bioderm First Aid Anti-Bacterial Ointment is a translucent antibiotic ointment that helps speeds the healing of cuts, scrapes and burns. 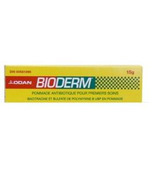 Bioderm Ointment is manufactured by Odan Laboratories Ltd., a Canadian pharmaceutical company that develops, manufactures and markets pharmaceutical specialties branded and generic products.